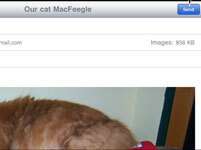 Photos on your iPad can be easily shared with your friends via e-mail. When you e-mail photos, they are sent as attachments. Photos you share can be saved on the recipient’s computer, iPhone, or similar device, printed, or shared with others. 1Tap the Photos app icon in the Dock on the Home screen. 2Tap the Photos tab and locate the photo you want to share. Photos are displayed as small thumbnails. Scroll until you find the photo you want to e-mail. 3Tap on the photo to select it and then tap the Menu button. The Menu button looks like a box with an arrow jumping out of it. When you tap the Menu button, a menu appears. Add an e-mail address in the To field, and type a description in the Subject field. You can also tap within the body of the message and add an explanation if you want. The message and photo go on their way. You can also copy and paste a photo into documents such as those created in the Pages word processor application. To do this, press and hold a photo in Photos until the Copy command appears. 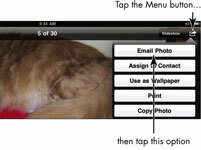 Tap Copy and then, in the destination application, press and hold the screen and tap Paste.